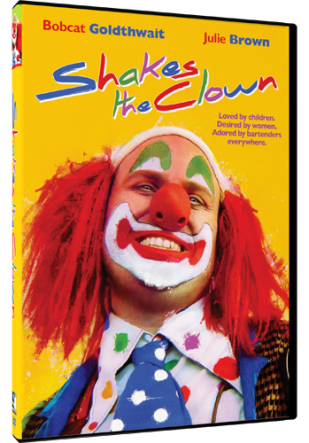 Out now on DVD Shakes the Clown from Mill Creek Entertainment with MSRP of $9.98 and stars Bobcat Goldthwait (Those Who Can’t TV Series), Julie Brown (Melissa & Joey TV Series), Paul Dooley ( Runaway Bride), Adam Sandler (Happy Gilmore) , Robin Williams (Good Morning Vietnam). Dueling gangs of clowns are pitted against each other in this outrageously funny comedy written by, directed by, and starring Bobcat Goldthwait. Julie Brown co-stars as the hard-working waitress who stands by her clown. Bobcat stars as Shakes, an amiable, alcoholic bozo from Palukaville, USA. But after one particularly wild night, Shakes wakes to find he's been framed for murder. The hilarious suspects include a pack of rude rodeo clowns, a gang of mimes, and an ambitious party clown with eyes for Shakes' sweetheart. As unlikely a superhero as you'll ever meet, Shakes takes to the streets for a slapstick showdown that blows the lid off the big top. Features hilarious performances by Adam Sandler, Florence Henderson, and Tom Kenny (TV's SpongeBob SquarePants). My Opinion: This movie is funny and I am surprised I have never seen it before as it did come out in the early 1990’s and Bobcat Goldthwait I remember had a funny voice when he talked be very loveable. This is definitely one you should see.